Can you tell me what ‘the one on the left’ is? 3 what they are speaking about. So, listen carefully to this context, because this context is very important to understanding and making sense of the listening itself. Looking at a joke book? What’s the answer? You know it (probably ‘dentist’ or ‘dental clinic’) simply from your knowledge of the world. When you look next at IELTS preparation materials, practise using common sense to predict answers. Answer the following question just using common sense. There will be strong growth in ………………. snacks, such as muesli bars. Racing , Touring , …….………, and Ordinary. The shop is conveniently located at the ………………. of Pitt Street and Hill Avenue. What do they watch on the television at 6 pm? A. A romance film. B. A program on Chinese cooking. C. The nightly news. D. A talk show program. 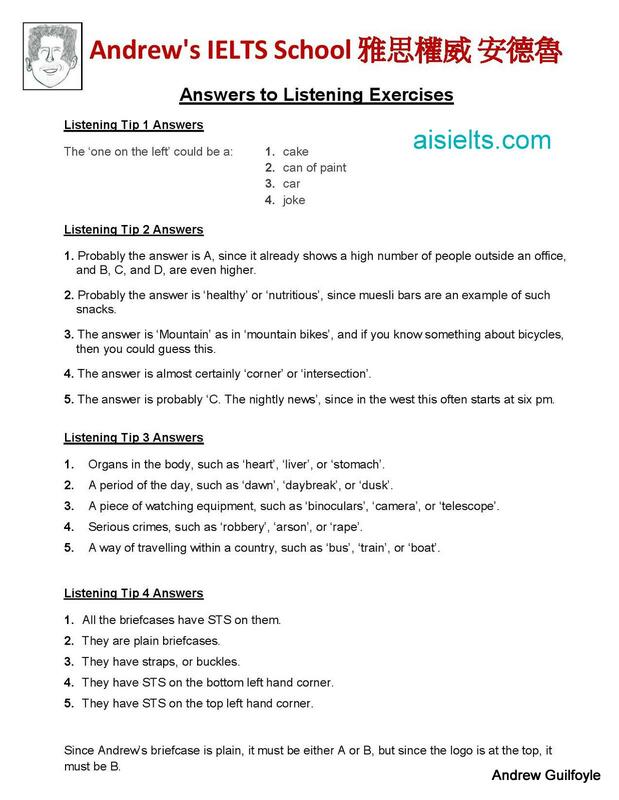 Many IELTS listening questions are ‘type’ questions – in other words, the answers are a ‘type’ of something. When faced with this, think about the sort of answers it will be. In this way you have prepared your mind for the sound and shape of the answer, so you will find it much easier to catch it in the listening. ‘Name two kinds of movies Peter enjoys very much’. Hmmmm. 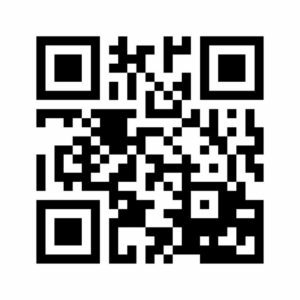 ‘Romance, Adventure, Horror, Action, Science Fiction’. Say them aloud, since one of these might well be the answer. ‘Read’ the type of answer for these five questions. Say them aloud. Think of as many possibilities as you can. Sources of humours in the body: Gallbladder, spleen, ……… and ……… . The best time for watching birds is …………………………. .
To watch birds, we need: ……………… and ……………… . How did she travel within Vietnam? ………………….. .
Briefcase A has a brand name ‘Sagi’ on the left hand side, and a scratch on the right hand side. Briefcase B has the name on the right …..
What is the same about all of the briefcases? What is the same about A & B? What about C & D? What about A & C? What about B & D? Read the following dialogue and work out which briefcase they are describing. Andrew: I think I lost my briefcase. Sue: What does it look like? Andrew: Well, it’s got the company logo, STS, on it. Sue: Does it have any distinguishing features. You know, locking buckles, straps, scratches, and so on? Andrew: No, it’s just a plain briefcase, with just the logo at the top. What is the answer? The answer is … ‘B. sunscreen’, but that is not what you read in the question, was it? This difference between what you hear, and what you read on the question paper, is very possible in the listening test. So, be ready for such ‘paraphrasing’ when you are doing the test. When you read the question, paraphrase some of the key words. Give synonyms or other words to say the same thing. Match the following terms with their paraphrasing. 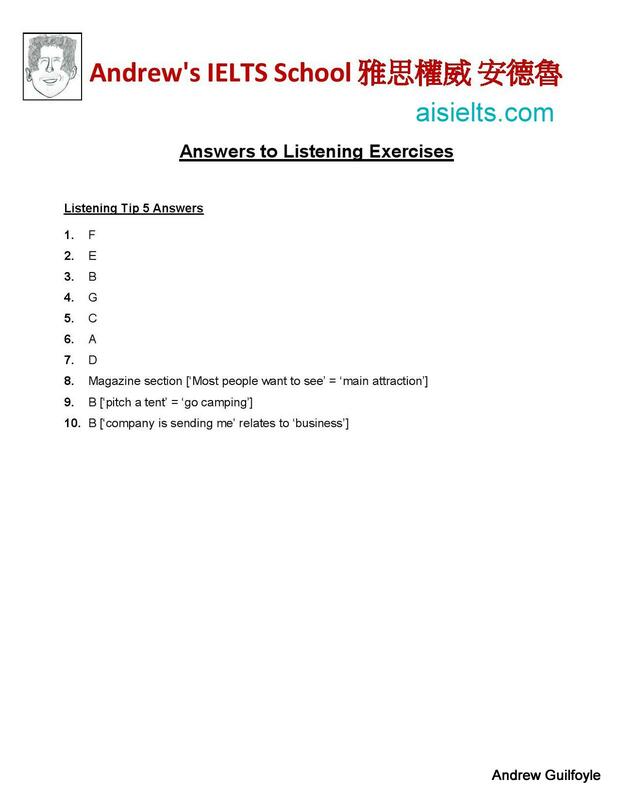 I wrote this exercise based on just one listening test from an IELTS book, showing just how common paraphrasing is. Now fill in the gaps. You hear: The video section has fans too, although most people want to see the magazine section, but the non-fiction is popular with researchers. Question (9): The couple could: A. stay in a hostel. B. go camping. C. stay in a caravan. D. stay with friends. You hear: I suppose, if all the hotels are booked up, we can always just pitch a tent. You hear: My company is sending me to China for two and a half years.